Easter can’t come soon enough for me. I am excited to spend some time with the family, to enjoy some food, drink too much and to put my feet up for an hour or two. 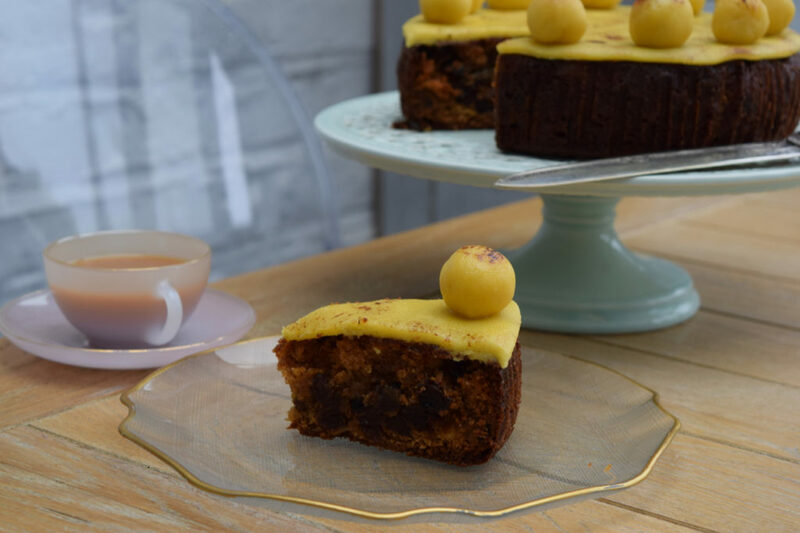 You can keep all your cheap chocolate, give me a bloody great big slice of Simnel Cake and I will be as happy as Larry *Grayson? the Lamb? * Easter is a right old food-fest for us and a time to reflect and to eat together. And for two of the cousins in our group to revise for their GCSE’s, poor boys. 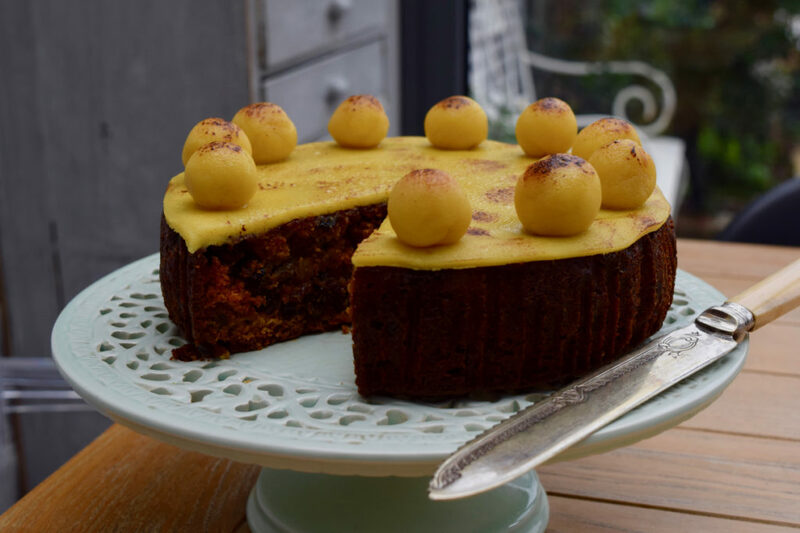 I will be arming myself with a Simnel Cake, this Easter, although I am not sure if I’ll be sharing it. 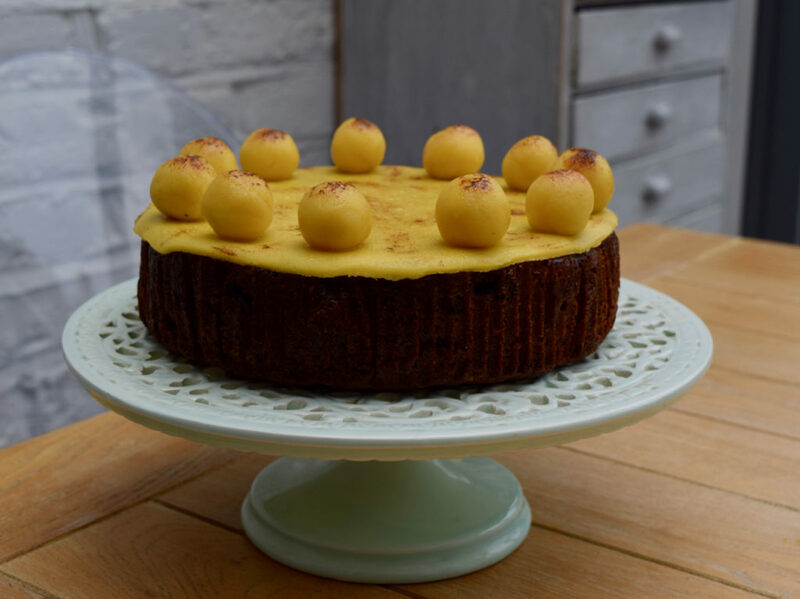 The Simnel Cake is a vintage classic. It’s been around since medieval times and I’ve not been able to fathom where it’s name came from. The marzipan balls on the top represent the eleven apostles minus Judas and this cake is traditionally eaten before or during Easter. To be fair, I would eat this all year round, however. Unlike a Christmas cake, this is much less of a kerfuffle. The cake is made using the all in one method, which is self explanatory and cooks in around 2 hours. The marzipan just needs to be rolled out, one circle is layered in between the cake mixture and the other laid on the top. This is then given a light grilling with either a blow torch or pop it under a hot grill for a moment. The cake is rich but not heavy and there is tons of my most favourite marzipan to go round. 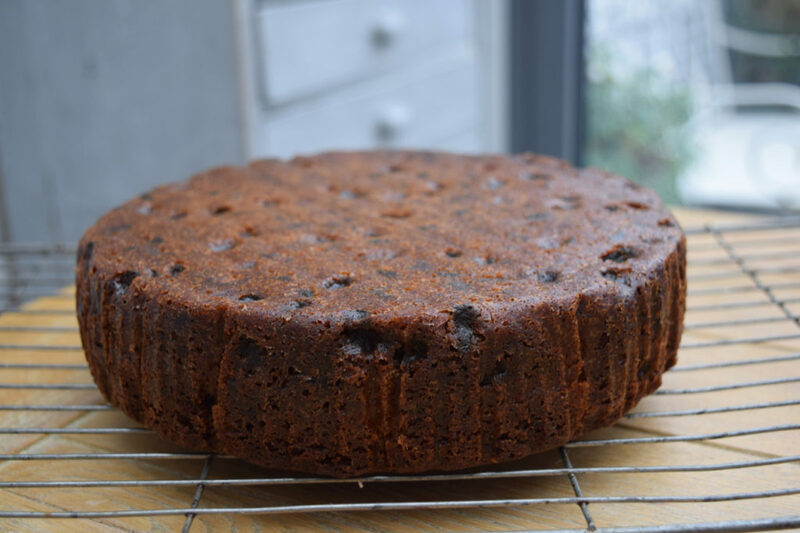 I took advice on this recipe from the evergreen Mary Berry, with seasonal thanks. This cake is such a seasonal classic. I have made it part of our Easter feast and I can hugely advise you do the same. It’s worth it as an excuse to eat big balls of marzipan, with the fruit cake being a total added Easter bonus. Pre heat your oven to 140 degrees fan assisted and line your cake tin. 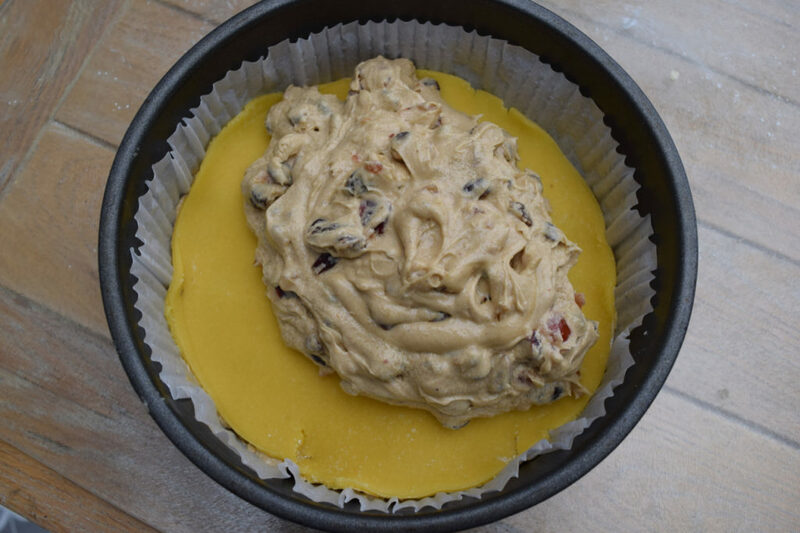 Cut 175g of the marzipan off and roll out into a circle the same size as your cake tin. 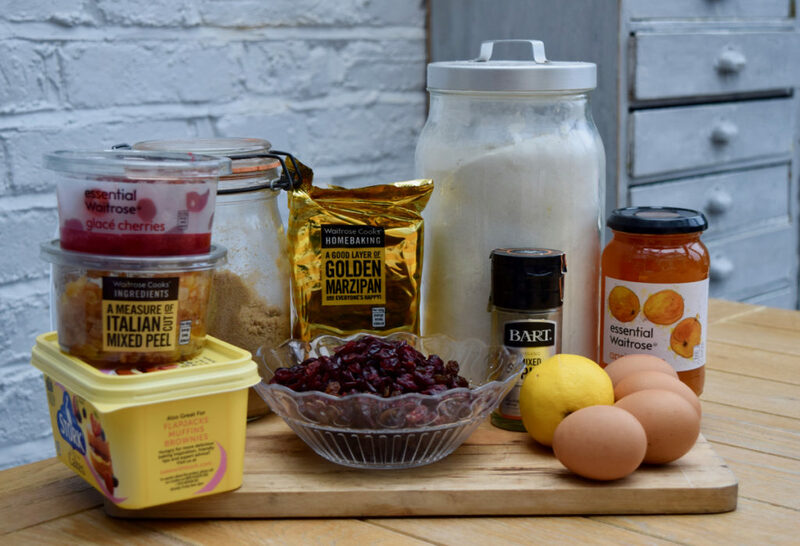 In a stand mixer or in a bowl with a wooden spoon beat the soft butter, brown sugar, eggs, flour, sultanas, dried cranberries, cherries, peel, lemon zest and mixed spice. Mix until everything is well combined. Scrape half the cake mixture into your lined tin then top with the circle of marzipan. Spoon on the second half of the cake mix and level the top. Pop into your pre heated oven for 2 hours. You may need an extra 15 minutes, so keep an eye on it towards the end. Cover the top of the cake with baking paper if it is browning too quickly. The finished cake will be firm, dark golden and a skewer will come out clean when inserted into the middle of the cake. Leave the cake to cool completely then remove from the tin and take off the paper. Of the remaining marzipan, roll 11 small balls about the size of a walnut. Roll the rest out into a second circle the same size as your cake tin. 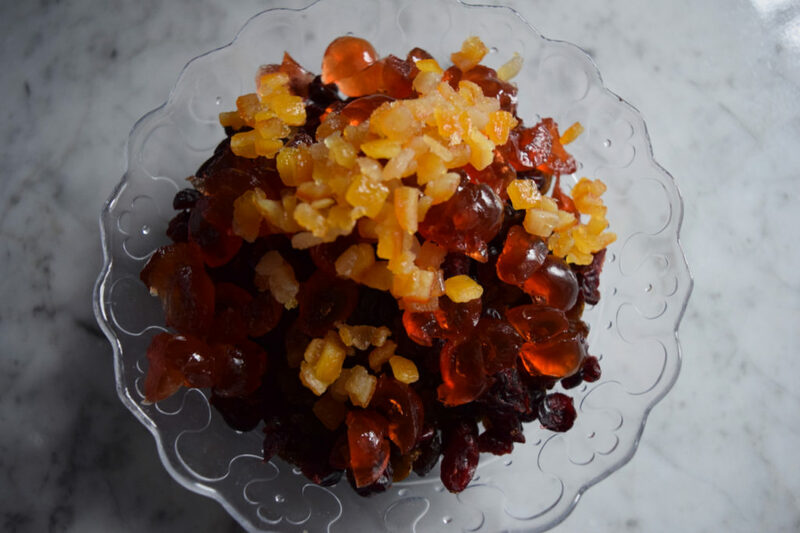 Once the cake is cool, heat up the apricot jam and then spread it onto the top of the cake. 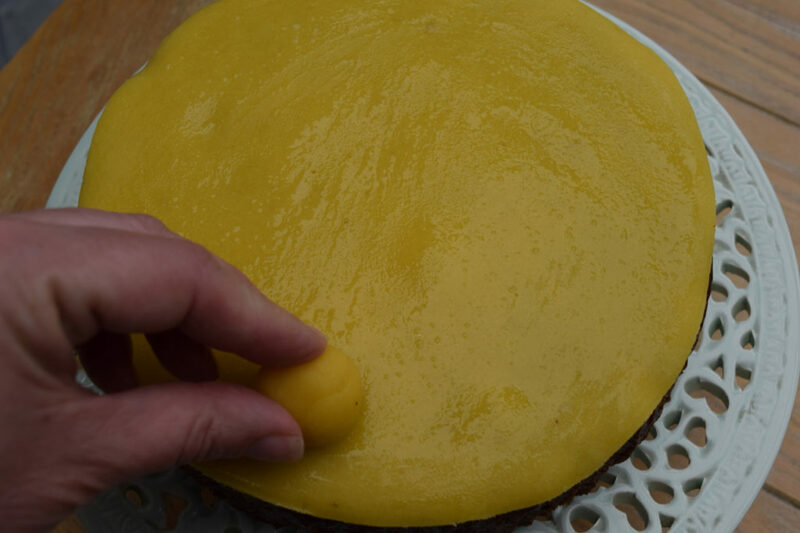 Lay the marzipan circle onto the jammed cake and press down lightly. Using some egg white as glue, stick the 11 balls around the edge of the cake then brush the whole lot, balls too, with the rest of the egg white. Using a cooks blow torch, lightly scorch the marzipan balls and the top of the cake until just golden. You could always do that under the grill if you don’t have a blow torch. Cut into generous slices. The cake will keep well wrapped in an airtight tin for a good week or two.